Buy Popcorn Factory online - TVC Skyshop - Buy world-class innovative products at affordable prices offering full value for money. Popcorn has never ceased to be favourites among people. This light and fluffy snack is high on taste. Instead of venturing out to get yourself popcorn, you can now enjoy all pop corn flavors at home with a least possible effort. Now there's no need to buy expensive popcorn in malls and cinema halls when you can make hot & fresh popcorn at your home, office or picnics with the TVC Popcorn Factory. Make tasty butter, salted, cheese & caramel popcorn in minutes with this popcorn maker. Popcorn contains lot of fibre, so it is an ideal snack for people looking to lose weight and on diet. Popcorn Factory has a non-stick coating that makes cleaning the unit easy. With this small pop corn machine, you are now always ready to enjoy movies and cricket match with friends, family and snacks. Popcorn Factory Hot & Fresh Popcorn in Minutes Popcorn has never ceased to be favourites among people. This light and fluffy snack is high on taste. Instead of venturing out to get yourself popcorn, you can now enjoy all pop corn flavors at home with a least possible effort. Now there's no need to buy expensive popcorn in malls and cinema halls when you can make hot & fresh popcorn at your home, office or picnics with the TVC Popcorn Factory. Make tasty butter, salted, cheese & caramel popcorn in minutes with this popcorn maker. Summary: Popcorn contains lot of fibre, so it is an ideal snack for people looking to lose weight and on diet. Popcorn Factory has a non-stick coating that makes cleaning the unit easy. With this small pop corn machine, you are now always ready to enjoy movies and cricket match with friends, family and snacks. 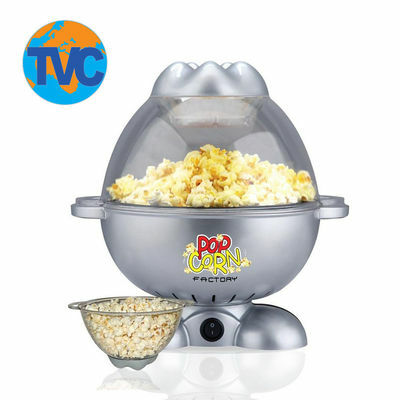 Features: • Make hot and fresh popcorn in minutes • Non-stick coating for easy cleaning Warranty: 6 Months.